Smash Bros Party. . HD Wallpaper and background images in the Super Smash Bros. Brawl club tagged: party mario link samus pikachu sonic donkey kong snake wii. 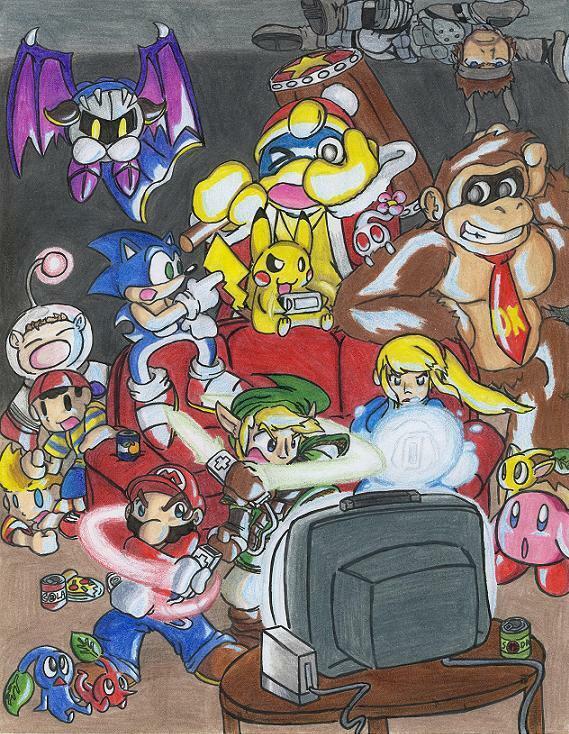 This Super Smash Bros. Brawl fan art might contain anime, comic kitabu, manga, cartoon, and mkono. woa are they playing super smash bros on the wii? Sure! And Pikachu is winning! xD How can you tell? LOL What is Snake doin' on the ceiling!? Link is like SHAAAAK !!! RAWRRRR !!! Playing Super Smash Bros in wii? WA HA HA HA HAAAAAAAAAAAAAAAAAAAAAAAR!